The hugely successful 'Godzilla' series is based on an an original story credited to writer Shigeru Kayama. The first 'Godzilla' film was made in 1954, the screenplay being co-written by Ishiro Honda and Takeo Murata, and the 400ft-tall dinosaur with nuclear halitosis was still going strong well into the nineties! By the way, 'Godzilla' is not a name but a species, as are many other of what appear to be names in the titles. 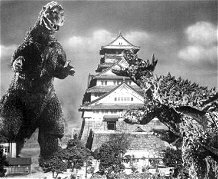 The first two films, 'Gojira' and 'Gigantis', were shot in black and white but all subsequent productions were made in colour. 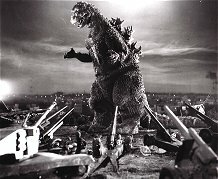 Originally produced by the Japanese film company Toho with the expertise of director Ishiro Honda, Kaiju Eiga ( monster movie ) participants can essentially be briefly described as giant monsters and mechanical constructions who either try to destroy the world or save it depending on whether they are 'goodies' or 'baddies'. On the way, they manage to stomp models of various Japanese cities into rubble causing more than a little distress to the local human population. In later films it is not quite so straightforward as that because some of them changed sides from film to film. Not only is that a bit confusing but each film has anything up to a dozen or so alternative titles, sometimes in duplication of other productions, and the translation and spelling of their 'names' changes as well. Check my monster A to Z or have a look at the film listings and you'll see what I mean! 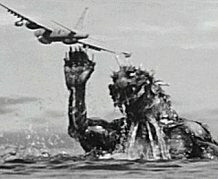 Although Toho were the original creators of the Kaiju Eiga genre, by the early Sixties quite a few Japanese film companies had climbed on the bandwagon with their own monster creations, most notably the childrens film studio Daiei with 'Gamera', but also Nikkatsu with 'Gappa', Shochiku with 'Guilala'. 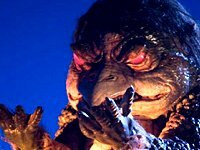 The Shin Toho studios also produced some 'monsters' which appeared in their 'Supergiant' series but these are not generally considered to be true Kaiju Eiga. The destructive violence was massive but this was generally only as a result of combat between themselves. Humans only suffered as a by-product of the demolition and were not subjected to individual physical violence. 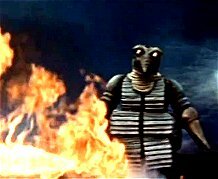 The monsters were mostly people in rubber suits - the first 'Godzilla' was actually Tomoyuki Tanaka, the producer of the film - were virtually all endowed with a male persona and all of an amphibian nature until 'Gappa' in 1967. A notable exception to this was 'Mothra' which was a giant female moth and a construction manipulated by wires, similar to a marionette. The storylines mostly tend to go like this: Giant 'monster', one or more, sometimes with alien 'help' threatens mankind's existence. Scientists can do nothing to stop it and run around like headless chickens. The military are worse than useless as tanks and stuff just annoy it. Another giant 'monster' puts down its pipe and slippers and comes to the rescue, eventually saving the world after a titanic battle during which, in most cases, poor old Tokyo ( or Japan in general ) gets pretty well levelled. Still with me? So far as I have been able to make out, this is a list of all the films that fall within that general brief. I have only given a couple of the most often-quoted titles for each film and in some cases a brief description of what ( I think ) it is about. The years are suspect as well, but that seems to be a standard problem in the film review area. There is sometimes a differential between production and release years and also between the years of release in its native country and the U.K. or U.S.A. I believe most of the years quoted are original release dates. The first 'Godzilla' film was bought by Joseph E. Levine who edited out some of the original scenes and inserted newly-shot footage by Terry Morse, featuring the actor Raymond Burr, into the film to make it more attractive to the American market. The modified version was released in the U.S.A. in 1956. This practice became fairly widespread with 'foreign' films during the Sixties. 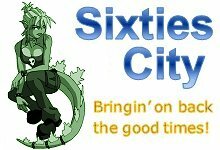 The Sixties films obviously fit in with my Science Fiction film list but, as some of them tend to be part of a running series, I thought I might as well separate them and try to give you the lot. No doubt this will generate some email comment but I don't really want to spend too much more time on it - only if there are any absolutely howling errors (which, looking at it more closely, seems quite likely). Please let me know - I'm sure you will anyway! A 400ft tall dinosaur is awoken from seabed 'hibernation' by atomic tests. Emerging from the sea it displays its displeasure by proceeding to flatten Japan. It is eventually lured back into the water where it is subdued by Dr. Serizawa's 'oxygen destroyer' which removes all the oxygen from the surrounding seawater. A modified version of the film lasting 98 minutes and with extra footage starring American actor Raymond Burr was released in the U.S. in 1956. An atomic explosion awakes two monsters - Gigantis ( a Godzilla ) and Anguirus - who are discovered fighting each other on a remote island. Gigantis triumphs and heads towards Tokyo, demolishing Osaka en route. He is eventually buried under an avalanche of ice precipitated by military forces on a snow-covered island. A modified version of the film was directed by Hugo Grimaldi and produced by Paul Schreibman for release in the U.S. in 1959. 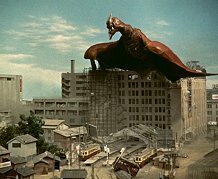 This was the first Kaiju Eiga film to be made in colour and featured a giant reptile able to fly at supersonic speeds, the ensuing shock waves causing immense damage. It hatches deep in a coalmine and emerges to consume a swarm of Miganuron, giant dragonflies. Rodan finds a mate and they eventually build a nest on the dormant volcano Mount Aso where new eggs are laid. This proves to be a major error of judgement when a subsequent eruption initiated by military missiles incinerates the brood and their parents. A version of the film with American voice-over by David Duncan was released in the U.S. with 5 minutes cut from the original length. The U.S. navy under the local control of Commander Bradley are carrying out chemical experiments on water desalination which unwittingly disturb the siesta of a giant reptilian creature. It decides to march towards Tokyo to give it a piece of its mind and, in the process, tramples all over the island where Bradley and his wife are carrying out their experiments. The beast is immune to military weapons but eventually succumbs to a cocktail of poisonous chemicals fired into its underbelly. A U.S. voice-over version produced by Jerry A. Baerwitz was released in 1961 drastically cut and re-edited to 70 minutes including the extra scenes featuring American actor Myron Healey.